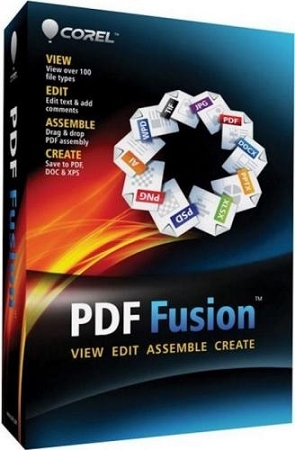 Corel PDF Fusion: Get all the power of the leading PDF solution--without the high price--with new Corel PDF Fusion. Easily create PDFs just by dragging and dropping. Open almost any file--including PDF, graphics and Microsoft Office formats--with support for more than 100 formats. Save files to PDF, XPS and DOC formats to reuse content without starting from scratch. Review and comment for easy collaboration. Plus, edit or add text anywhere in a document, and rearrange, rotate or crop pages with ease. Once you're done, assemble documents in minutes and share them in a single PDF package.